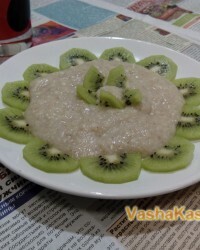 Millet porridge is considered a traditional old Russian dish, which 100-200 years ago was one of the main dishes on the dining table. If you cook this dish with the addition of pumpkin, you get an incredibly useful, nutritious porridge. Such a breakfast is an incredible charge of vitamins for the body. 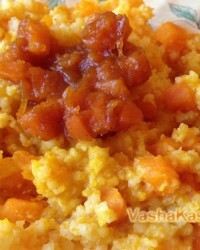 The recipe of millet porridge with pumpkin in a slow cooker, unique in its idea, I learned from my mother. If you show imagination, then in a classic recipe you can add raisins, nuts, prunes, dried apricots, jam and other ingredients. 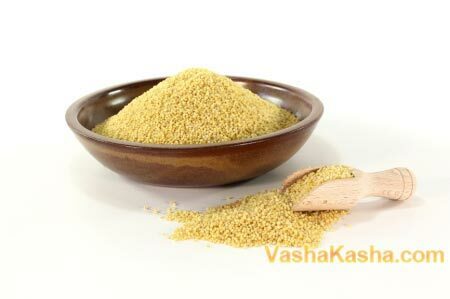 Pumpkin porridge with millet is very useful for people who feel weak, as well as actively engaged in mental and physical activity. 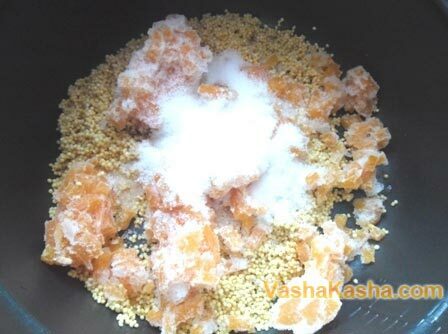 Millet porridge with pumpkin in a multicooker improves metabolism and serves as a cleansing agent. Pumpkin porridge cooked in a slow cooker (as in This recipe), according to this recipe, it turns out extremely tender, appetizing, fragrant and melting in the mouth. Having tried once, you will constantly cook it. This dish is cooked simply and quickly. 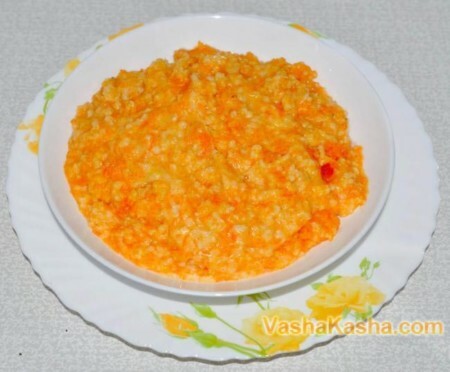 You can also cook wheat porridge with pumpkin and meat for a unique recipe. To prepare the dish, it is necessary to prepare all the ingredients, pour them into the multicooker cup, press the “START” button. Most of the multi-cookers and pressure cookers are equipped with a “delayed start” function, which facilitates the process of cooking porridge. This mode is equipped with technology companies such as Polaris, Philips, Redmond, Panasonic, Scarlet. This feature is convenient and practical to use, it allows you to get a hot, freshly prepared dish for a specific time. 1. 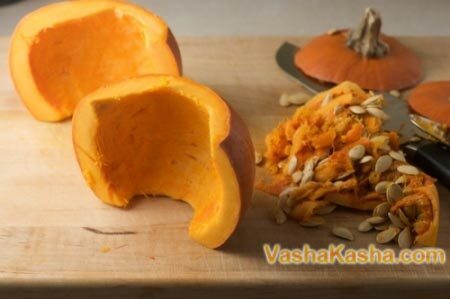 Peel the pumpkin and remove the seeds. In porridge, they will not be useful to us, but you should not throw them out. 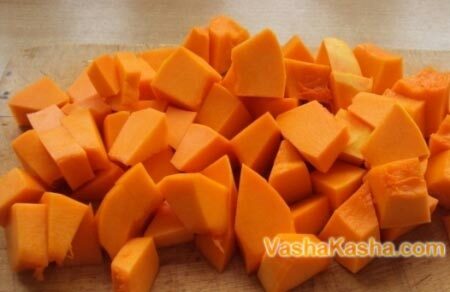 You can dry them and use them as a delicacy, which is not only tasty, but also very useful. 2. Next, cut the pumpkin into cubes. The smaller you cut a pumpkin, the faster it will be prepared. 3. Millet go through the trash. 4. Carefully wash the grits, pour over boiling water and soak for 10 minutes so that the bitterness is gone. 5. 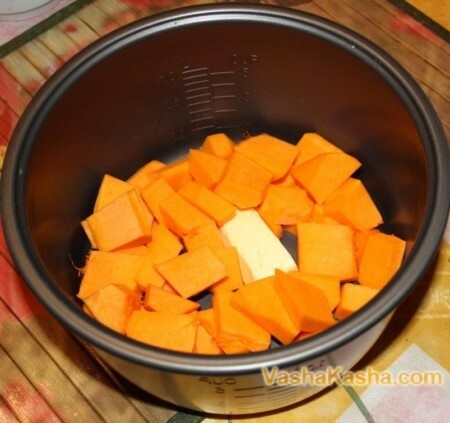 At the bottom of the bowl of the multicooker we place the pieces of pumpkin before lubricating it with oil. 6. Fall asleep with grain, add sugar, salt. 7. We measure off the 4 cup of milk, so the porridge will get thicker. If you want a thinner porridge, pour in 5 glasses. Add 20 grams of butter. 8. Close the lid and set the mode “Milk porridge”. If there is no such mode, select the function “Krupa”. Cooking time is about 30 minutes. 9. After the signal, do not open the lid immediately. Let the porridge infuse. If desired, you can add a small amount of butter and a pinch of cinnamon to it, mix and leave for 30 minutes. Thus, the dish will become more nourishing and fragrant. 10. We put the finished porridge in portions. You can decorate with nuts, berries. Pumpkin porridge on milk ready. This gruel can be served for breakfast, lunch or dinner. It will appeal to all members of your family. This dish is especially useful for children of preschool and school age. Due to its chemical composition, the porridge nourishes the growing organism with vitamins and minerals. This dish strengthens the immune system, normalizes metabolism, gives the body vivacity and energy. The main advantage of this recipe is satiety and extraordinary ease. Porridge is considered a dietary product, the portion contains 300 kilocalories, so you can safely include it in the diet without worrying about those extra pounds. Even more you will enjoy crumbly millet porridge in a slow cooker. 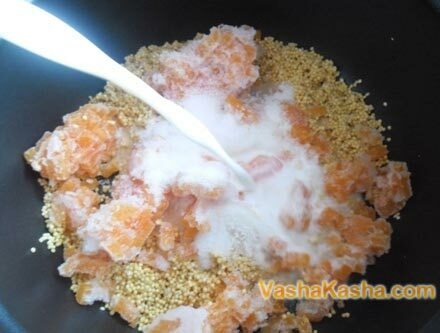 If you do not have a multicooker, we advise you such a dish as millet porridge with pumpkin on milk recipe which you will find on the link. Thank you very much!!! Me and my child liked porridge. minutes 20, and then put the rest of the components. Thanks for the recipe !!!! Very tasty porridge turned out, And most importantly, the children liked it !!!! Very tasty. Only I did without salt, and instead of sugar, you can add honey to the finished porridge. 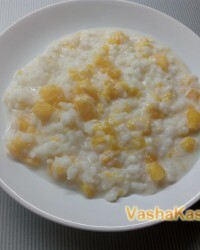 Oochen porridge is delicious, I recommend it to everyone! In Russian, there may be no such word. From Belarusians, I heard him. Not only Russians use runet. Be tolerant, this is a dialect.